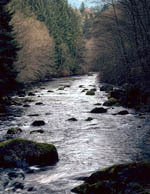 The lower Cedar River mainstem and its four main fish-bearing tributaries provide the majority of the current spawning habitat for chinook and sockeye salmon and steelhead trout in the WRIA 8 system. This subarea also provides significant spawning and rearing habitat for coho salmon and cutthroat trout. Factors contributing to the decline of salmon habitat in this subarea include fish access and passage barriers, altered hydrology and flow, and degradation of riparian conditions. Salmon habitat projects in the Lower Cedar Subarea funded through the WRIA 8 collaborative process are now included in the Habitat Work Schedule (HWS) state-wide website. In the website, click on the WRIA 8 watershed on the state map to enter our HWS website.